Fnatic Rising have conquered the UK League Championship. 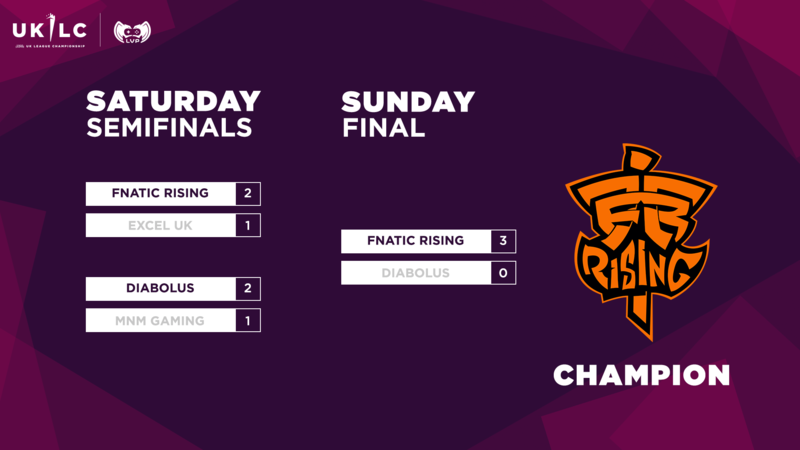 With a 3-0 win over Diabolus, Fnatic fulfilled their star-studded roster’s potential and unlocked first seed at EU Masters! The finals may have been rather one-sided, but that tells nothing of the two teams’ back-and-forth struggle for domestic dominance over the course of the season. That struggle extended to the semifinals, where both sides where forced to come from behind in order to even make it to the last match. Here’s what went down during the 2019 UKLC Spring Split Playoffs! Our first semifinal provided a clash of two of the biggest brands in the UKLC: both LEC teams, Fnatic Rising and Excel UK. While the best-of-3 ended in Fnatic’s favour, they were made to work for it; especially in Game 1, which went against them as they failed to overcome Excel’s Sona/Taric bot lane. Fnatic had a firm grip on every Dragon in the series thanks largely to the vigilance of their jungler, Dan, and that control proved vital in Game 2. Already behind, Excel were baited out to contest the Elder Dragon in order to prevent Fnatic from getting a 5-dragon Elder buff. That provided Shikari with the perfect opportunity to make a game-winning flank on Kennen and even out the series. The top laner was making plays on Kennen again in Game 3, hitting a 5-man ultimate to gift his team a huge lead in the mid game and ensuring that they were able to close out the series. The second semifinal saw first seed Diabolus take on MnM Gaming, who had finished fourth in the regular season. Like the previous semifinal, the lower seed struck first blood in the series, but was ultimately unable to close out the win. MnM were unafraid to open the first game with a greedy draft. First-picking Kog’Maw and Kayle, they ensured that they had scaling on their side. So, when they were ahead in gold and objectives even before the mid game was played out, a quick finish was inevitable. Diabolus returned with a vengeance in Game 2, as Munckizz showed his prowess for the prolific ganking style for which he has become renowned. Stealing objectives and Marshmallow lives with equal ease, he set Diabolus on course for the win. If their previous contest had ended in a relatively straightforward fashion, Game 3 was anything but. With MnM crafting a composition that was built to play to the strengths of their mechanically gifted solo laners, they could win any team fight. But Diabolus had formidable split-push pressure through Kerberos, who was playing his third Yorick game of the series. 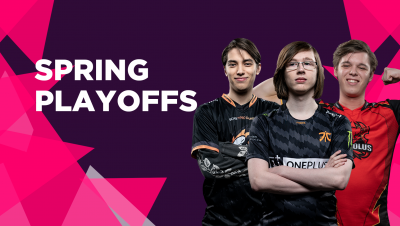 After finally pulling through, Diabolus and Fnatic were set up for a winner-takes-all best-of-5 in the 2019 UKLC Spring Split Playoffs Final. The first game, at 31 minutes, proved to be the longest in the series. That statistic is telling of the kind of dominance Fnatic Rising displayed in the Final, though they were not without their obstacles. Kerberos’s Game 1 Cho’Gath was one scarily large hurdle to overcome, as Diabolus almost sneaked back into the first match off the back of his team fight presence. However, with his team too far behind it was not to be, and Fnatic took the lead in the series. 🎥 Despite a valiant attempt at a Diabolus defence, @FNATIC march on and take the first win of the series! Diabolus’s issues in the first game seemed to stem from a bot-lane centric composition, where Yusa’s Vayne was the primary damage source for the team. Partnered together with a Rakan, it was easy enough for Fnatic to take advantage of their weak laning phase and shut down the single threat on the line-up. That problem was exacerbated in Game 2, where Diabolus picked virtually the same composition, but swapped out a Lissandra for an even less reliable damage source, Zilean. Once again, Fnatic could abuse the linear, late-scaling draft to snowball themselves an early lead, and this time they did it even more cleanly, dropping only one kill in a sub-25-minute win. We are now ONE GAME AWAY from winning @LVPuk‘s first-ever #UKLC! Already 2-0 down in the series, Diabolus needed a strong start to Game 3 in order to turn things around. 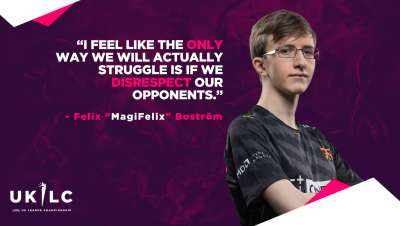 But things immediately took a turn for the worse in the sixth minute, as MagiFelix deftly played around a mid lane gank to push his team ahead. And MagiFelix was a catalyst for his team to continue to make inroads into the Diabolus base as the game progressed, sending nukes their way every time an opponent dared rear their head within Paddle Star! range. With an absurd 32.8k damage to champions in 30 minutes and 54 seconds, his Zoe kept the Devils pinned back and Fnatic pushed to victory. 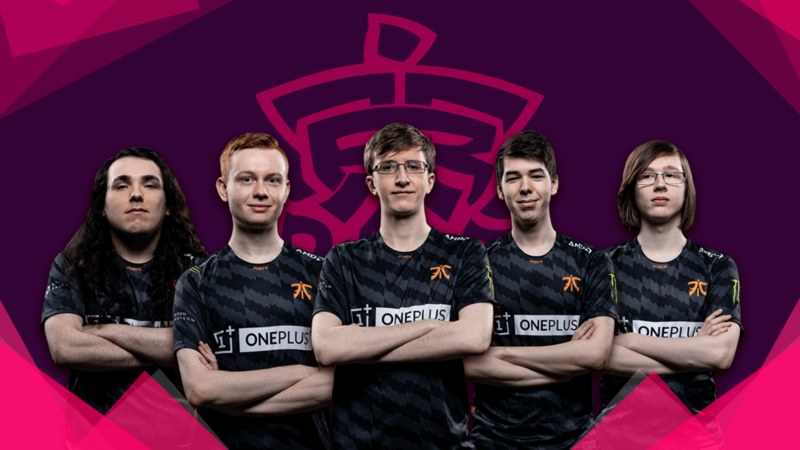 With their win, not only did Fnatic secure the glory of winning the inaugural UKLC title, they also ensured that they earned the UKLC’s first seed to EU Masters. That means they’ll skip the Play-In Stage and enter straight into the Main Event, alongside other top teams from Europe, later this month. 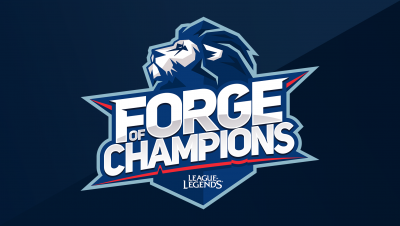 Now that Playoffs is finished, we also have Forge of Champions to look forward to. Amateur teams from across the British Isles will compete in a pair of Open Tournaments in order to qualify for Forge. If they qualify, they’ll play against the UKLC teams in a giant cup format. UKLC teams which finished the season in 2nd-5th place will receive a bye past the first round, giving them a better shot at reaching the final. The winner of the final will go up against our first-placed team, Fnatic Rising, in the Grand Final for a chance to win the Forge of Champions trophy. Then there’s the Promotion Tournament, where Bulldog Esports’ inferior head-to-head record with Barrage means that will have to fight for their UKLC survival alongside DarkSpawn Gaming. They’ll be joined by teams from the Forge of Champions Open Tournaments and compete for two spots in the UKLC Summer Split!